When I told David, my older brother, some of the crazy stories about everyday life in Italy, he suggested I should keep a diary and maybe, someday I could turn it into a book. During 2008 I spent three months in Sicily, in a futile attempt to find work. Mr Sensible knew thought I was mad, she was aware of the high unemployment in Sicily and couldn’t understand why I was heading south. She did explain to me that most Sicilians were heading north in their search for work. Mrs Sensible was once again correct. I didn’t find any work, but I did have the beginnings of a book. 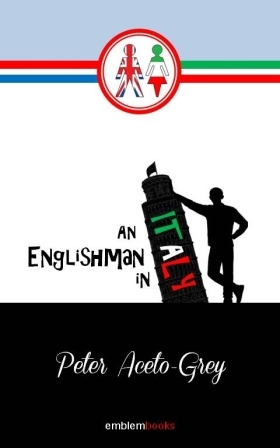 While I was in Sicily I sat down and started to write notes on the bizarre and often hilarious day-to-day struggles of trying to survive in Italy with only Mrs Sensible and of course my English/Italian dictionary. I have launched the book on the crowdfunding site Kickstart to raise some funding to publish the book BIG LINK HERE. I hope you enjoy my blog. If you do, please will you help me to, in Jennifer’s words, social media the crap out of my little book as soon as it is released. Ohh I am looking at a book launch in Sheffield. BBC radio Sheffield said they will interview little old me. Sooo excited. hey Pecora Nera how’s the book coming along? Hi, the publisher sent it back for me to agree a few changes. So I am reading through it yet again. Congratulations! I would love to read it. Are you going to be selling it or will it be available at Amazon or some such other Big Box Globalizing Evil-doer store? (are my politics showing? ;P ) I would buy it from Amazon if I had to but I would rather give you the money as I know you would get more. It will be available in real paper, and also from the Evil-doer stores. As soon as it is printed I will let you know. You clever person!!! Well done, a real accomplishment! mmm, you need to read it first, you might not think it is so great. If it’s written by the same author as the blog, I’m sure it’s a scream 🙂 Let me know when it comes out so that I can read it and plug it on WordPress/Facebook. That is so nice of you. I will go and chase the publisher for the date. What a nice comment. 🙂 I will cut this out and frame it. Pecora Nera, I, too, will be anxious to see the book! I have my own stack of incredible stories about adapting to life on the island of Korcula…it’s a long, long way from California! Piacere. I am trying hard to get it ready for the end of this month. Turn your stories into a book. Promise to purchase a copy of this book. You’ve done it! Congratulations! Is it ready to be social media-ed yet?? Heck – all these bloggers writing books … guess it’s time I join the bandwagon and finish mine. *puppy dog face* is it here yet? Just can’t wait for this book! I am trying to get it printed but I am up to my neck in work and moving house. Any news on the book? Dying to read it! I sent the book to the publisher and said I was considering adding one of Mrs Sensible’s recipes at the end of each chapter. They thought it was a good idea so I delayed the print while I added them. Unfortunately I am waiting for Mrs S to finish writing 2 recipes. I will have a glass of wine and with a bit of dutch courage I will hassle her to finish them. I like it. Will need to check it out.